Get a 4-foot gate when you purchase $3,000 or more of products. Top-quality materials for long-lasting beauty. Complete step-by-step instructions included. Every fence requires gates. From simple walk gates and swinging vehicle gates, to specialty gates and commercial gates that are compatible with automatic gate operators, gates are a critical part of every fence installation project. Jerith, the leading U.S. manufacturer of ornamental aluminum fences, treats its gates as seriously as it does its modular fence designs. Whatever style you choose, Jerith has matching aluminum gates in multiple styles, designed to complement your fence and provide long life and perfect function that lasts as long as your fence. Jerith aluminum gates are made with the same special aluminum alloys and finished with the same chip and peel-proof finishes as their aluminum fences. Jerith’s exclusive hinges and EverLatch latch systems get the same high-quality design and manufacturing treatment, no matter which grade of fence you purchase. 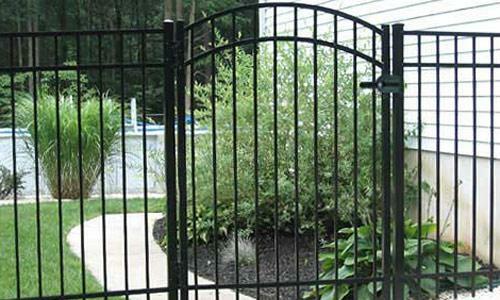 Detailed drawings of aluminum fence gates are available for upon request. Please call or email us for detail. 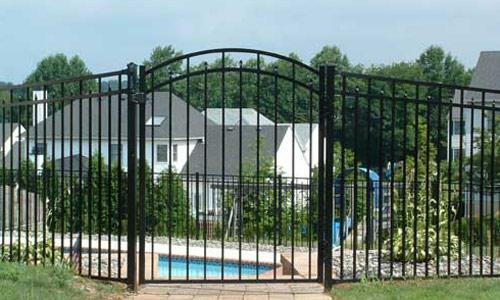 We have the most competitive prices for our aluminum fence gates. Since 1983, we have been committed to offering high-quality materials at affordable prices. Choose the style you like and contact us for an accurate price quote. 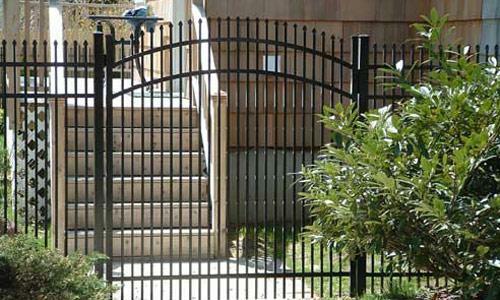 Straight Gates – Built to duplicate the design, color, and height of each style of fence, these aluminum gates provide a seamless look for your fence. Jerith’s patented self-closing hinges and EverLatch latches complement the completed gate. Widths of 36", 42", 48", 60", and 72" are available. 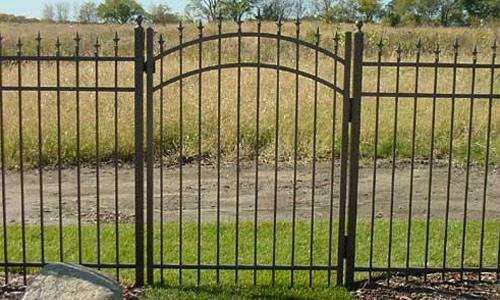 Arched Gates – Available at additional cost, arched gates provide a distinctive difference for your entrances. 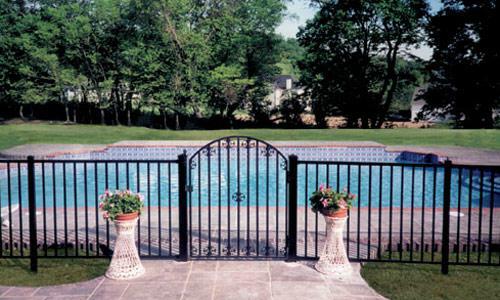 Each aluminum gate is designed to beautifully accent your fence. 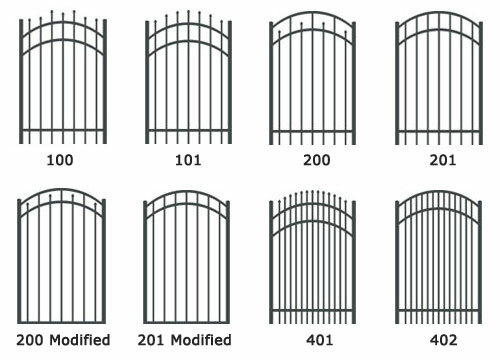 Arched gates are available in the same widths as straight gates. 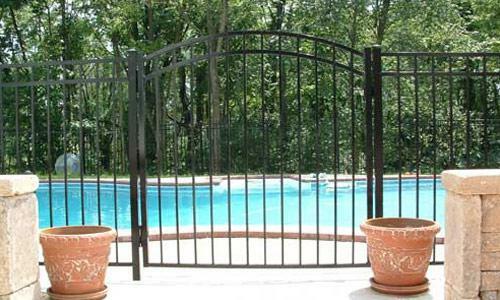 Straight Gates – Available in 36", 48", 60", 72", 84", and 96" widths these aluminum gates use the same strong construction as the Aero Fences themselves, including the soft edges and corners. Jerith self-closing hinges and high-tech latches complete the gates. Arched Gates – As with the Residential grade, these aluminum gates have a raised profile that accents them and adds interest to any fence. 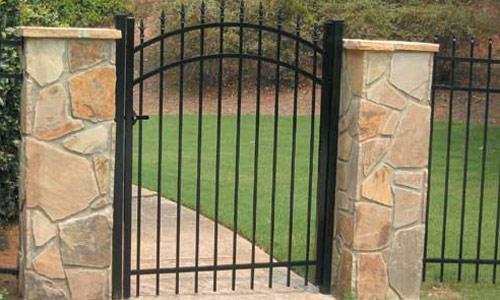 The extra cost is more than made up for by the improvement in appearance and instant visibility of the gate. Straight Gates – Available to match Jerith’s Industrial Grade fences in every detail, these aluminum gates are available from 36′ to 72" in width, and use hinges and gate posts specially designed to handle their weight. Arched Gates – From simple arched gates for pedestrian traffic to vehicle gate pairs that arch to the center of the pair, these gates add elegance and distinction to any commercial fence installation. Specialty Gates – Swing aluminum gates for vehicle entrances larger than can be accommodated by standard gates, along with cantilever gates up to 20′ long are available to match any Jerith Industrial Grade fence design. All are smooth in operation, simple to install, and are compatible with gate operating systems. 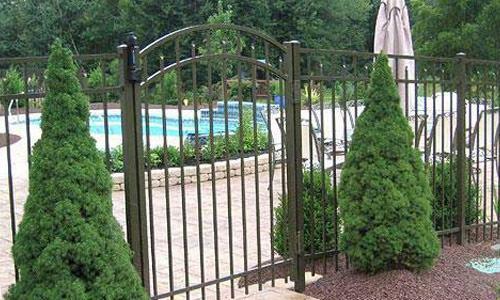 Engineered for easy operation and long life, they are the pinnacle of ornamental gate design. Customize and personalize your new aluminum fence by selecting accessories. Elegant finials for posts plus scrolls and circles to highlight your fence are available in styles suitable for every fence style and grade. Or select optional gate latches, including magnetic latches. See the Jerith Product Brochure for details on all of these accessories and more. Among the many reasons that Jerith is the leader in aluminum ornamental fencing is the care in engineering, excellence of materials and quality of design that goes into every one of its products. At our discount fence supply company, the care and quality is why we’ve chosen Jerith as our supplier of ornamental aluminum fence products. Our long-time volume purchasing relationship with manufacturer lets us pass along substantial discounts to our customers, and Jerith has the volume of production needed to get even special orders shipped quickly to you. Besides the low fence cost, you will get reliable pre- and post-sale installation support. Contact International Security Products soon to discuss your ornamental fence project or request a quote on how much your new aluminum fence and gate costs. Our experienced fence consultants will be glad to work with you to make sure every detail is handled to your complete satisfaction.